Our study into bike sharing outlines how to maximize its potential. Innovative mobility offers and altered consumer behavior are increasingly transforming the traditional ways in which people travel around their local area. More and more people in cities are taking up bike sharing offers, giving them a fast and inexpensive way to get from door to door. As a result, bike mobility solutions are set to experience sharp growth averaging 20 percent per annum in the coming years. By 2020, the global market for bike sharing is expected to be worth between 3.6 and 5.3 billion euros. 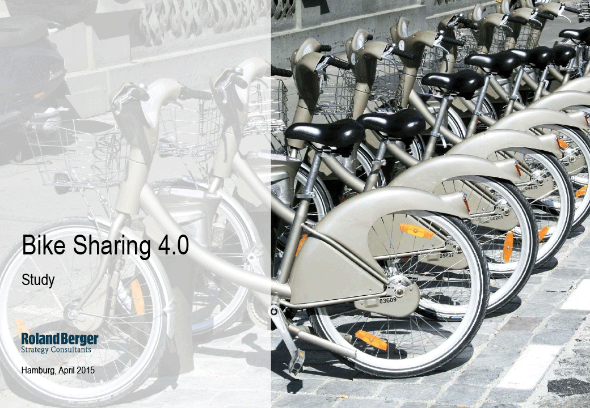 This is one of the findings of "Bike Sharing 4.0", the latest study by Roland Berger Strategy Consultants. "The market for bike sharing solutions offers enormous potential the world over," explained Roland Berger Partner Tobias Schönberg. "But providers must think their business model through from start to finish in order for it to be successful." There has already been a marked trend toward the use of bicycles in the world's big cities in recent years: between 2008 and 2013 alone, the global bike sharing market saw 34 percent annual growth, reaching a market volume of 1.3 billion euros. The number of bikes in the schemes rose from about 24,000 to more than 640,000. Asia is the strongest market, offering some 460,000 rental bikes, followed by Central Europe with almost 147,000 units. The right business models can be highly profitable in this segment – EBIT margins can reach 10 to 15 percent. "It depends greatly on local demand but also on the provider's choice of financing model," explained Tobias Schönberg. "The running costs for maintenance, space rental, insurance and so on are fairly moderate in themselves." Financing is primarily based on fees in 95 percent of cases: one-time subscription fees and then usage fees every time a bike is rented. About 90 percent of operators also finance their business through advertising revenues; one third take advantage of public subsidies or direct investments. The Roland Berger experts examined different business models to see what makes bike sharing models profitable. They identified six key success factors. High density network: Bike sharing schemes are used more often when there is a high concentration of pick-up and return points that are easily accessible. Bikes should also be available to rent at train and bus stations to make public transportation options more attractive. Multimodal integration: Bike sharing schemes should be linked into the local public transit network. This will ensure that pick-up points, payments systems and options for passengers to change modes of transportation are optimally aligned. Simple handling: Users must be able to pick up and return bikes easily and flexibly around the clock. Making it easy to register with a credit card or rail ticket increases the level of acceptance of bike sharing schemes. Attractive pricing: Free minutes for every journey and low registration costs make a scheme attractive to both casual and long-term users. Besides that, prices should be below the cost of bus or rail tickets. High-quality bikes: Modern, sturdy and weatherproof bikes ensure a comfortable ride and keep maintenance costs down. Support of local authorities: Working with the local authorities is one of the keys to a successful bike sharing concept. After all, it is they that provide bike lanes and make rental space available. The rapid development of this market is generating increasing interest among other players as well. "For private investors, new investment alternatives are emerging in the bike sharing sector offering attractive returns," explained Roland Berger Partner Tobias Schönberg. "But we are also going to see other kinds of companies moving into the value chain in the bike sharing market." Digital and technical innovations, for instance, are going to influence the new product offerings very greatly. Examples include the use of GPS devices to make it easier for users to find their way around. The devices will also provide information on available pick-up and drop-off points or timetables for other public transit options. Strategic partnerships with IT providers, online chauffeur services and social networks will emerge here. Operators of e-mobility solutions are also going to have a share in this significant market – contributing with the help of electric bicycles to the continued success of the bike sharing sector.